Greece Ferry ticket reservations, ferry timetables and passenger information for Greece Ferries sailing to and from the Greek Islands, Greece and Europe with Hellenic Seaways, Blue Star, ANEK, LANE, ANEK Superfast, Minoan, Agoudimos, Cyclades Fast Ferries, Superfast Ferries,, Endeavor Lines, European Sealines, Erturk Lines, Aegean Speed Lines, Sea Jets or Ionian Ferries. Booking Greece Ferry tickets has never been easier, compare all Greece Ferries prices in real time and book the cheapest available Greece Ferries tickets to and from the Greek Islands, Greece and Europe with Hellenic Seaways, Blue Star, ANEK, LANE, ANEK Superfast, Minoan, Agoudimos, Cyclades Fast Ferries, Superfast Ferries,, Endeavor Lines, European Sealines, Erturk Lines, Aegean Speed Lines, Sea Jets or Ionian Ferries online with instant confirmation. Travelling by Greece Ferry is a quick, easy and stress free way to get there and back again. Book your cheap Greece Ferries tickets to and from the Greek Islands, Greece and Europe with Hellenic Seaways, Blue Star, ANEK, LANE, ANEK Superfast, Minoan, Agoudimos, Cyclades Fast Ferries, Superfast Ferries,, Endeavor Lines, European Sealines, Erturk Lines, Aegean Speed Lines, Sea Jets or Ionian Ferries online and enjoy more choice and flexibility. With the latest Greece Ferries crossing information and timetables for all sailings to and from the Greek Islands, Greece and Europe with Hellenic Seaways, Blue Star, ANEK, LANE, ANEK Superfast, Minoan, Agoudimos, Cyclades Fast Ferries, Superfast Ferries,, Endeavor Lines, European Sealines, Erturk Lines, Aegean Speed Lines, Sea Jets or Ionian Ferries including information on the ferry ports and useful tourist information about the destinations our detailed route and city maps will help you plot your Greece Ferries ferry journey. 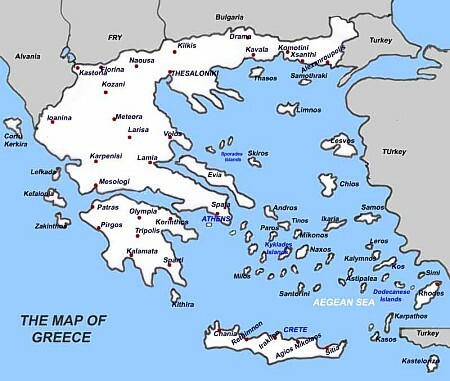 If are travelling to the Greek Islands, Greece and Europe with Hellenic Seaways, Blue Star, ANEK, LANE, ANEK Superfast, Minoan, Agoudimos, Cyclades Fast Ferries, Superfast Ferries,, Endeavor Lines, European Sealines, Erturk Lines, Aegean Speed Lines, Sea Jets or Ionian Ferries then book a ferry crossing with Greece Ferry and arrive at your destination be it Aegina, Agistri, Alonissos, Amorgos, Aegiali, Anafi, Ancona, Andros, Antikythira, Astypalea, Bari, Brindisi, Cesme, Chania, Chios, Corfu, Donoussa, Ermioni, Fethiye, Folegandros, Glossa, Gytheion, Heraklion, Hydra,Igoumenitsa, Ios, Iraklia, Kalymnos, Kastelorizo, Kea, Sami, Kefalonia, Poros, Killini, Kimolos, Kissamos, Kithnos, Kos, Koufonissi, Kythira, Lavrio, Leros, Lesvos, Sigri, Marmaris, Methana, Milos, Mykonos,Naxos, Nisyros, Paros, Patmos, Patras, Paxi, Piraeus, Poros, Porto Heli, Rafina, Rethimno, Rhodes, Samos, Karlovassi, Santorini, Schinoussa, Serifos, Sifnos, Sikinos, Skiathos, Spetses, Syros, Thessaloniki, Thirassia, Tilos, Tinos, Venice, Volos or Zakynthos refreshed, relaxed and happy. Greece Ferries offers fantastic fares to and from the Greek Islands, Greece and Europe with Hellenic Seaways, Blue Star, ANEK, LANE, ANEK Superfast, Minoan, Agoudimos, Cyclades Fast Ferries, Superfast Ferries,, Endeavor Lines, European Sealines, Erturk Lines, Aegean Speed Lines, Sea Jets or Ionian Ferries ferry ports. Book Greece Ferry tickets to and from the Greek Islands, Greece and Europe with Hellenic Seaways, Blue Star, ANEK, LANE, ANEK Superfast, Minoan, Agoudimos, Cyclades Fast Ferries, Superfast Ferries,, Endeavor Lines, European Sealines, Erturk Lines, Aegean Speed Lines, Sea Jets or Ionian Ferries online in advance to enjoy the cheapest available ferry ticket price. The price you see is the price you pay. There are no hidden extras or surprises such as added fuel surcharges or booking fees and we do not charge you anything extra for paying with a Visa Electron card. The price we quote you for your selected Greece Ferry route, onboard accommodation and vehicle type is all you will pay, and that's a promise. To obtain a Greece Ferry ticket price and book your ferry ticket securely online please use the real time ferry booking form on the left. Most of the Greek islands and many main cities of Greece are connected by modern high-speed ferry craft, including hydrofoils and catamarans. 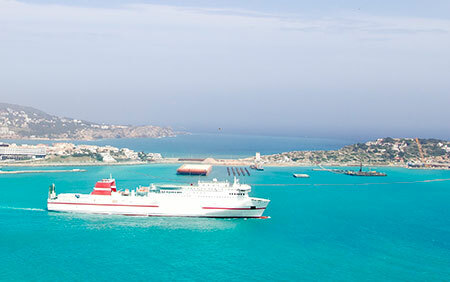 There are three ports in Athens: the main port Piraeus and outlying Rafina and Lavrio port. These serve all islands, but central Cyclades islands such as Tinos and Mykonos, it is often better to leave from Rafina. There are several smaller independant ferry operators however their services are erratic and quite often unreliable. When it comes to Greece's famously gorgeous islands, it's hard to take your pick out of the 6000 options you have, 227 of them being inhabited. Their rocky coast lines, sandy beaches, charming villages, sheltered bays and many yacht harbours make them extremely popular among all kinds of travellers. The large island of Crete is a highly popular tourist destination, with landscapes varying from great sandy palm beaches to snow-covered high peaks and stunning river gorges and a good deal of night life in its main tourist towns. If you're looking to party at night, lovely Mykonos or Ios are good options too. The volcanic island of Santorini is one of the most romantic picks and offers some spectacular views. Its whitewashed capital of Fira is dramatically situated on the edge of a 400m high cliff, overlooking a beautiful blue lagoon. Other popular ones are Lesbos, Paros, Lefkada and Kos. The National Marine Park on Zakynthos is the primary nesting ground for loggerhead sea turtles in the Mediterranean. The rugged, green hills and valleys of Kefalonia boast a number of vineyards, and the island's cliffs and beautiful beaches make it a tourist hotspot. For a slightly more authentic and less touristy experience, try Syros, Amorgos or any of the other small and less developed islands. Greece offers a myriad of experiences, landscapes and activities. It is the pulsing nightclubs of Mykonos and the ancient beauty of Delos; the grandeur of Delphi and the earthiness of Ioannina; the rugged hillsides of Crete and the lush wildflowers of spring. It is the blinding light of the Mykonos sun, the melancholy throb of Thessaloniki's rembetika (blues songs), the tang of home-made tzatziki, the gossip in the kafeneia (coffee shops). Ferries are about the one thing in Greece that leave on time so be prompt. New "fast ferries" are cutting distance times in half but prices are slightly more expensive. Sometimes, it is more practical to fly, especially to Crete or Rhodes. However, flights are usually more expensive. Santorini is 8 hour slow boat from Athens but the entrance view from the boat is spectacular. Best Price Guarantee - We always offer you our lowest available Greece Ferry ticket price and there are no hidden extras or surprises such as added fuel surcharges or booking fees and we also we do not charge you anything extra for paying with a Visa Electron card. The price we quote for your selected Greece Ferry to or from the Greek Islands, Greece and Europe with Hellenic Seaways, Blue Star, ANEK, LANE, ANEK Superfast, Minoan, Agoudimos, Cyclades Fast Ferries, Superfast Ferries,, Endeavor Lines, European Sealines, Erturk Lines, Aegean Speed Lines, Sea Jets or Ionian Ferries onboard accommodation and vehicle type is all you will pay, and that's a promise! In the unlikely event you find the same all inclusive Greece Ferry ticket to or from Aegina, Agistri, Alonissos, Amorgos, Aegiali, Anafi, Ancona, Andros, Antikythira, Astypalea, Bari, Brindisi, Cesme, Chania, Chios, Corfu, Donoussa, Ermioni, Fethiye, Folegandros, Glossa, Gytheion, Heraklion, Hydra,Igoumenitsa, Ios, Iraklia, Kalymnos, Kastelorizo, Kea, Sami, Kefalonia, Poros, Killini, Kimolos, Kissamos, Kithnos, Kos, Koufonissi, Kythira, Lavrio, Leros, Lesvos, Sigri, Marmaris, Methana, Milos, Mykonos,Naxos, Nisyros, Paros, Patmos, Patras, Paxi, Piraeus, Poros, Porto Heli, Rafina, Rethimno, Rhodes, Samos, Karlovassi, Santorini, Schinoussa, Serifos, Sifnos, Sikinos, Skiathos, Spetses, Syros, Thessaloniki, Thirassia, Tilos, Tinos, Venice, Volos or Zakynthos cheaper in the brochure of any other tour operator we promise that we will do our best to beat that price or offer you the choice of requesting a refund. To book Greece Ferry tickets please click here. At ferryto.co.uk you are able to obtain live Greece Ferry ticket prices, check availability and book Greece Ferry car and passenger ferry tickets to and from the Greek Islands, Greece and Europe with Hellenic Seaways, Blue Star, ANEK, LANE, ANEK Superfast, Minoan, Agoudimos, Cyclades Fast Ferries, Superfast Ferries,, Endeavor Lines, European Sealines, Erturk Lines, Aegean Speed Lines, Sea Jets or Ionian Ferries at our lowest available ticket price. Ferryto.co.uk is part of the world's largest online ferry ticket distribution network providing the ability to book over 80 major European ferry operators including with Greece Ferry to over 1,200 ferry routes throughout the UK, France, Spain, Ireland, Holland, Eastern Europe, the Mediterranean, the Baltic and North Africa.